As Rafael Nadal lay on the clay court, his arms outstretched in jubilee, it was clear that this had been the end of a unfortunate and frustrating streak. It seemed almost as if it had been conjured up in Hollywood, that his opponent on the day was the man who had initiated Nadal’s supposed downfall. 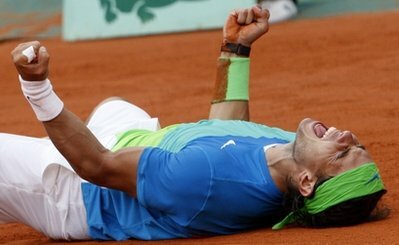 One year ago Nadal arrived at Paris with a niggling injury and fatigue sustained after his most fruitful year, in which he had won three grand slam titles and an Olympic gold medal, amongst other titles, before almost forcefully going to the Madrid Open and losing to Roger Federer in the final. The Roland Garros title was almost exclusively his grand slam title, and after equalling Bjorn Borg’s tally of four consecutive wins, he was on route to win his record fifth consecutive title. Then he met Robin Soderling in the last sixteen. After a long and tiresome game, Nadal began to show signs of fatigue and was eventually and shockingly beaten 2-6, 7-6, 4-6,6-7. Nadal didn’t beat Bjorn Borg’s record, and Soderling remarked that he was expecting a thank you call from Borg. It was the beginning of a Frustrating year for the Spaniard, who would later pull out of Wimbledon through injury and lose his number one spot to a resurrected Roger Federer, who finally got to win the French Open and dominate men’s tennis once again. It was significant thus, that Nadal’s moment of truth in Paris was not against Federer, his closest rival, but against the man who defeated him in Paris one year before. 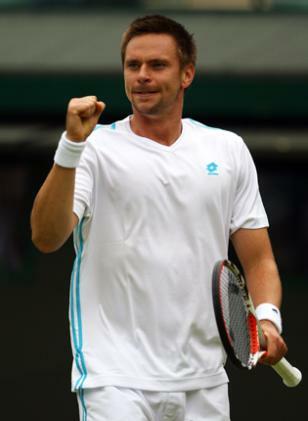 Many people despise Soderling, and many of them unjustly do so just because he beat Rafa Nadal. However, others dislike him because of his clearly manifested arrogance and disrespect, only rivalled perhaps with Novac Djokovic and Tomas Berdych, when facing the Spaniard. Others dislike the Spaniard for his rich kid attitude, his snobby appearance, the fact that he got close to Shakira, and by many Catalan nationalists, for his devout patriotism. The first case of this arrognace towards Nadal was shown during a third round Wimbledon clash in 2007. Initially, there were several moments of tensions on court between the Swede and the then world number two. Firstly, when a shot by Robin Soderling hit the net and went into Nadal’s side of the court, there was no courteous apology, as usually happens when a point in this manner, as Soderling clinched his fist and resumed playing. Moments later, when Soderling had come back from two sets down to even the game at 2-2, Nadal prepared to serve, but took too much time for Soderling’s liking. To show his bother, Soderling went to change his racket whilst Nadal was about to serve. Surprised by what he was seeing, Nadal took longer than usual and showed his ironic intentions to the Swede, who in turn reacted to this by mocking and imitating Nadal by picking is underpants and mimicking his mannerisms. Skip forward three years since that day in London, and on a cloudy day in Paris, Rafa Nadal cruised to a victory over his hated rival, 6-4,6-2,6-4, to gain the best revenge possible. Not only did he get back on terms with winning Opens, but he regained the number one spot and became only the second man to win the French Open at least five times, one shy of Bjorn Borg. Soderling tamley congratulated Nadal on his final address, and predicted more victories for him if he kept that form, though not without warning that he would do what he could to reach a third Roland Garros final. Before biting the trophy in his typical way, a serious but triumphant Nadal told Soderling, “Sorry Robin, I played my best match of the tournament. If not, it was going to be impossible to beat you”. Forced compliments perhaps, but whether he played his best match or not, Rafa looked unstoppable, and with Wimbledon around the corner, it looks like things are going to get very interesting in London.